Here’s good news for Angel Heart Cakes devotees. There’s now a dedicated space to get your fresh, seasonal cakes. 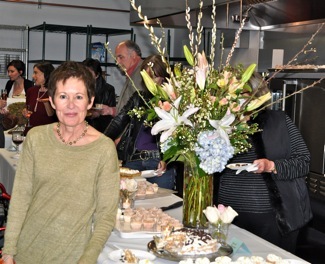 Owners – and Menlo Park residents – Debbie Umphreys and Chris Rivera have opened a retail store and gleaming new kitchen of their own at Marsh Manor, just over the border in Redwood City. Chris (pictured below left) gave InMenlo a tour of their new space, about two-thirds of which is the bakery, where they will turn out their cakes and cupcakes, all based on a family angel food recipe. But there are more attractions for people who wander into the front of the store, which features Queen Bee Ice Cream. “We were looking for a partner to share the space that would be complementary,” said Chris. You can purchase Chris and Debbie’s handmade granola and the food offerings of other local suppliers. 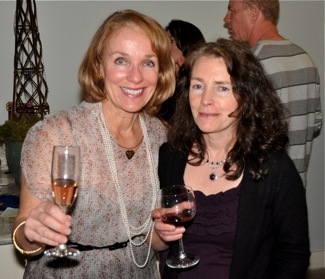 Maggie Foard (pictured with Debbie) makes goat’s milk-based fudge – yes she’s Kidding Around with Chocolate. Indelisa Montoro’s Couture Jams and handmade gift cards are also available. So think of Angel Heart Cakes’ new retail space as showcase for lots of local food people. And, for those Menlo-Atherton residents on the far west side of town, yes, Angel Heart Cakes will still be available at Sigona’s, Bianchini’s and Robert’s. Previous post: Hearts say Happy Birthday and Happy Valentine’s Day!